Yes to Justice! No to Occupation! This conference hopes to create a network to improve coordination, share resources, support each other’s work for justice, and create joint campaigns to stop the Apartheid Wall and end the Israeli occupation. We will continue to devise bold ways of non-violence that say “no” to occupation and “yes” to a just peace. We will learn from each others practical experience, share tactics and build on one another’s strengths. Come and be part of the joint Nonviolent struggle! 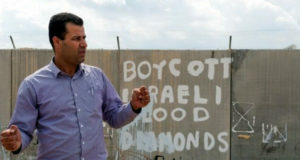 Bil’in is a Palestinian village that is struggling to exist. Since early 2005, the state of Israel has annexed close to 60% of our land for Israeli settlements and for the construction of Israel’s apartheid wall. Bil’in is fighting to safeguard our land, our people, and our liberty. 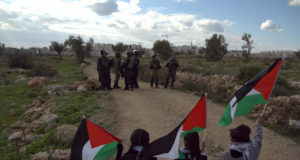 Bil’in’s Popular Committee and village residents, supported by Israeli and international activists, have peacefully demonstrated every Friday since February 2005 in front of the “work-site of shame” in opposition to the presence of the Apartheid Wall. 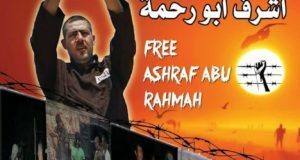 The Israeli army has consistently responded with teargas, sound bombs, clubs, rubber-coated steel bullets, and live ammunition. Bil’in is a symbol of what is happening across all of Palestine. By participating in the conference in Bil’in, you help everyone in Palestine continue their struggle for liberty.